It's been about 13 months since I purchased Final Fantasy VII from the PlayStation Network for consumption on my PSP. If you read my earlier post on the game, you'll note how excited I was to give this old classic another try. However, I stopped playing the game shortly after I made that post (which I had intended to be the first of a series of anecdotes about my experiences as I played through the game again), and I've barely touched it since. To this day, I find that the PSP is the perfect resting place for a PlayStation 1-era game like FF VII. The early polygonal 3D looks as good as it ever will on the 4-inch screen. And there is indeed something very novel about having a game that was once cutting edge in your pocket (assuming you have pockets large enough for a PSP). Obviously, it isn't the presentation that got old for me. It was the story. More specifically, I found that the story simply lost focus. After the exciting events that occurred at the top of the Shinra Corporation headquarters, I found my party out in the overworld, and I needed to chase after Sephiroth and stop him from destroying the world. After spending a play session or two grinding for levels in the countryside east of Midgar, I found that I had completely forgotten what my objective was. Luckly, there is really only one new place that you can go to at any given time in Final Fantasy VII. Yet, even following the path that was so obviously set before me, I could never seem to reconnect with the characters' motivation for continuing on their seemingly aimless journey. When I think back on playing FF VII years ago, I remember the game as a series of character-driven events (such as the murder of Aeris, Barret's encounter with a colleague of his who also has a gun arm, Cloud's identity crisis, and so forth), but in my return to the game most of what I have experienced since escaping the city has been extraneous material in what feels like a needlessly long RPG. I really want to love this game again, and yet when I load up my save, I'm stuck in the field below the Gold Saucer with no clear idea of why I should continue. 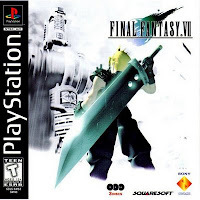 I question whether or not this game is best left as a positive memory or if I should try to rediscover why Final Fantasy VII is such a beloved game.